Google Launches Facebook News Feed Competitor That's Less Friend-Influenced : All Tech Considered In the feed, users will get a stream of news, photos and more based on their search histories and interests across Google products. The company promises a different, less friend-filtered experience. 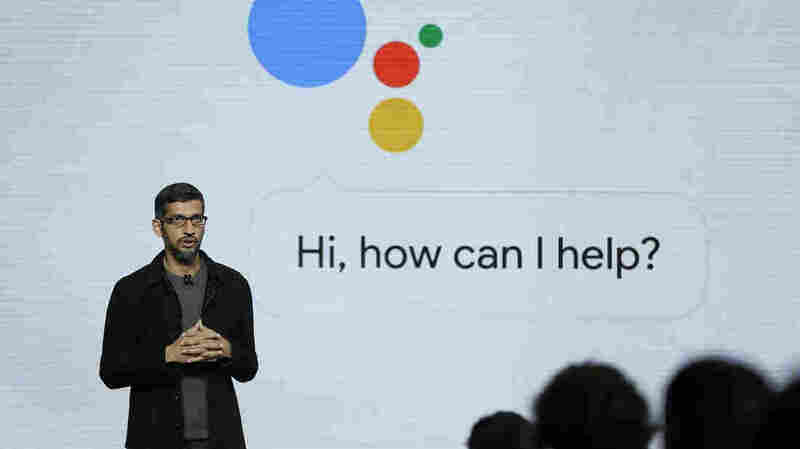 Google CEO Sundar Pichai talks about the new Google Assistant during a 2016 product event in San Francisco. The voice assistant is one of a number of Google products that will provide user data to the curation service that the company is launching Wednesday. Google Plus: Do You Need Another Social Network? "Google search should be working for you in the background even when you're not searching," says Ben Gomes, vice president of engineering, who spoke at a news conference at Google's San Francisco offices. "It should be looking for information on the Web to give you information that's important and relevant to you to further the interest that you have." Starting Wednesday, if you use the Pixel smartphone or the Google app (for Android and iOS), you'll see this personalized feed. It will continually draw from what Google has learned about you across its suite of products — such as Search, Gmail, YouTube, Calendar, the Google home assistant and Chromecast. Google and Facebook — which both make their money by selling advertising — are in a constant tug of war. Google has tried and failed to build a hit social network, but this new product could draw more eyeballs. Engineering leader Shashi Thakur explained how it is fundamentally different from the competition: "It's not really about what your friends are interested in, which is really what other feeds might be." Say you have a secret passion for woodworking: Relevant articles will show up in your feed. On the other hand, if you've been reading up on herpes that shouldn't show up in the feed, because Google is using technology to filter out "potentially upsetting or sensitive content." When it comes to political interests — take health care overhaul efforts — what you get on Facebook or Twitter is heavily influenced by your social network, which could push you into groupthink. Thakur says the Google feed breaks you out of that, because it's based on the same search algorithm that crawls and ranks the entire Internet, not just what your friends share. "We are trying to provide a variety of perspectives on any given topic," he said. Although in the near future, a spokesperson says Google does plan to add a like button to posts, so that users can actively indicate what they want to see. Aside from Pixel phones and the Google app, the feed soon will appear in your smartphone browser when you go to Google's search page. The company does not plan to include this feature on desktop browsers. Gomes and Thakur declined to say whether Google would include advertisements in the feed.